Currently viewing the tag: "Pat Jursik"
I’ve been sitting on the pictures in this post since last October and have been mentally composing what I wanted to say about them and the area depicted. But I just never got around to writing the blog. Well today my friend Bobby Tanzilo from OnMilwaukee.com brought it back to my front lobes. Developers would like to include an extended stay hotel as part of the University of Wisconsin – Milwaukee’s Innovation Campus at the county grounds in Wauwatosa. The campus is being developed by an affiliate of the UWM Real Estate Foundation who purchased the site from the county. Over this past weekend, a fire broke out at the Milwaukee County Courthouse, causing an estimated $500,000 in damage. In response to the fire, there has predictably been some individuals who’ve decided County Executive Chris Abele is to blame for the fire. Gov. Scott Walker said Friday Milwaukee County government should function more efficiently, under a County Board reform bill Walker signed into law. 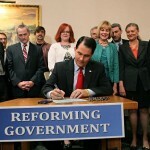 Whither Milwaukee County: Why Hasn’t Scott Walker Signed THE Bill? I would have thought that Governor Walker signing Representative Joe Sanfelippo’s Assembly Bill 85 to neuter the Milwaukee County Board was a slam dunk. Or is the governor really too busy jet setting from GOP enclave to GOP enclave? WEDC Pay Ain’t Enough To Keep Talent But Proposed Supervisor Pay Is No Problem! Last week Zach wrote about Governor Walker’s prominent policy initiative, the Wisconsin Economic Development Corporation, and their inability to retain qualified staff…particularly a Chief Financial Officer.